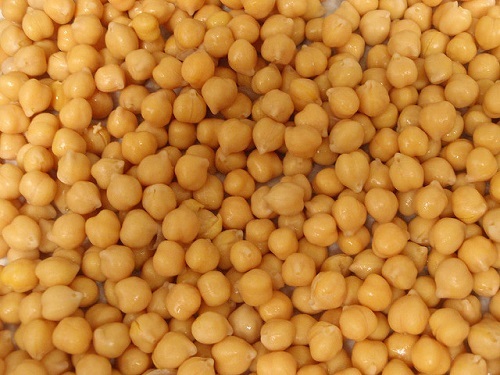 Garbanzo beans and chickpeas are the same plant, or specifically – the same legume. Like many plants, garbanzo beans and chickpeas are just among the various names and layman’s terms of the Cicer arietinum. Cicer arietinum belongs to the plant kingdom, Magnoliophyta division, Magnoliopsida class, Fabales order, Fabaceae family, and Faboideae subfamily. The plant’s genus is Cicer. Common names for this species are: ceci bean, India pea, Bengal gram, or Egyptian pea. The garbanzo bean or chickpea is one of the world’s earliest crops. It was cultivated as far back as the ancient times by ancient Egyptians, Greeks, and Romans. Though referring to the same species, “chickpea” is often the common name used by English-speaking people, while “garbanzo” is used by Spanish speakers. In a nation where both languages are used, the names may be used interchangeably. There are two known types of garbanzo beans or chickpeas – the Kabuli and the Desi. “The Kabuli” means from Kabul. It has a light color with large seeds as well as a smooth coat, a uniform size, and a round shape. This type is often cultivated in Northern Africa, Europe, Pakistan, Afghanistan, and Chile. The second type – the Desi (means local or native) – is almost the opposite of the Kabuli. It is small and dark with a rough coat. It is cultivated in India, Ethiopia, Mexico, and Iran. Unlike the other type of chickpea or garbanzo bean, the Desi has a thicker seed coat that contains a higher concentration of nutrients, specifically antioxidants like quercetin, kaempferol, and myricetin. The Desi is also richer in fiber and belongs to the group of foods with a low glycemic index. As a versatile legume, chickpeas are a staple ingredient in many Middle Eastern and Indian dishes. They are also an excellent source of zinc, folate, protein, and dietary fiber, and they are rich in minerals like phosphorus, calcium, magnesium, iron, and zinc. The plant has some additional health benefits – it can improve one’s diet and satiety. Its consumption can lead to a lower intake of processed foods and food in general, which decreases a person’s calorie intake. It is a good source of carbohydrates for diabetes and can contribute to better blood sugar control. Chickpeas also contain some unique antioxidants and are beneficial for the colon. Additionally, they improve blood/fat regulation and lower the levels of LDL cholesterol, which can decrease an individual’s chances of cardiovascular disease. Chickpeas or garbanzo beans are mainly produced in India, Pakistan, Turkey, Australia, Iran, Myanmar, Canada, Ethiopia, Mexico, and Iraq. Both types are available to use in either canned or dried form. The dried form requires soaking in water overnight before using in cooking, while the canned version can be used immediately. Aside from preparation, another difference between the two is that the dried beans have hulls that need to be removed before using, while the canned beans have their hulls removed in the factory. 1.Garbanzo beans and chickpeas are the same thing. They are both common names for a plant specie named Cicer arietinum. Because they are the same plant and entity, they share the same scientific classification, uses, types, and other identifying characteristics. 2.The term “garbanzo bean” is commonly used by Spanish-speaking or Latin people. Meanwhile, the term “chickpea” is used by English speakers. 3.The words “chickpea” and “garbanzo” have different etymologies. “Chickpea” is a term that descended from the English language, while the term “garbanzo” came from the Spanish language. Celine. "Difference Between Garbanzo Beans and Chickpeas." DifferenceBetween.net. July 30, 2017 < http://www.differencebetween.net/object/comparisons-of-food-items/processed-foods/difference-between-garbanzo-beans-and-chickpeas/ >. Hello, Neat post. There’s an concern together with your site in web explorer, may possibly check this? IE still is the marketplace leader and a huge component to folks will omit your fantastic writing because of this dilemma.